Shaped like its name suggests, the egg® stroller’s curved lines will provide a safe and stylish buggy for you and your baby. The egg® has been fitted with Tru-Ride Technology® tyres which have been engineered for comfort, superior handling and added durability. The one-hand fold chassis is compact and freestanding when folded and the three-position recline, parent and forward facing seat unit is spacious and comfortable. 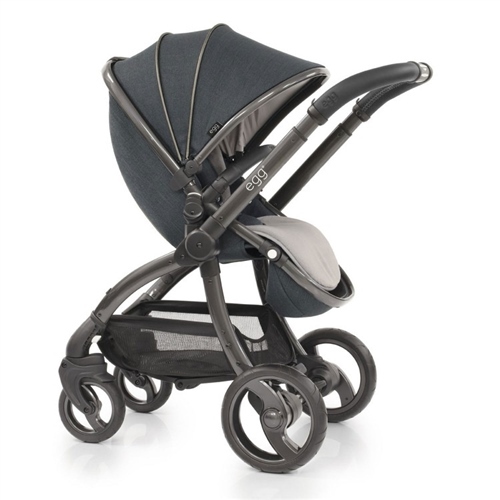 Seat unit is suitable from 6 months to a maximum of 15kg approx. Suitable for twins or toddler and baby siblings, a set of ‘S’ shaped seat adaptors convert the egg® stroller into a tandem pushchair, by providing 2 sockets for 2 seats (adaptors and tandem seat unit sold separately). The unique solid non-puncture PU rubber ‘Tru-Ride Technology®’ tyres are lockable at the front with a ‘step on, step off’ brake making the stroller extremely easy to manoeuvre. The large storage basket at the base of the egg® stroller provides easy access from the both front and rear, with enough space to comfortably hold the luxurious egg® changing bag as well as your other shopping bags. By simply rotating the barrel on the egg® and lowering the handlebar down, this releases the chassis. This allows the stroller to be folded by lifting a central carrying strap which is attached to the storage basket. The result is a very compact, freestanding fold.